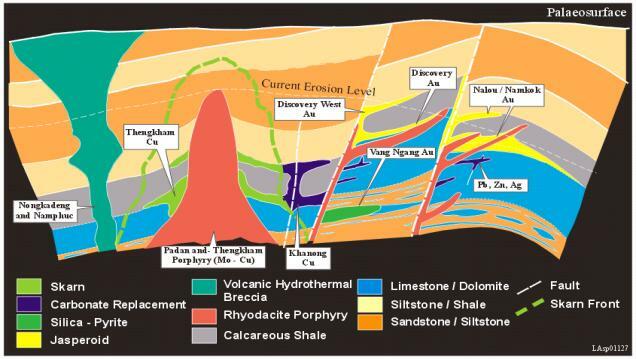 EXPLORATION AND DEVELOPMENT OF THE SEPON GOLD AND COPPER DEPOSITS, LAOS. Oxiana Limited, Level 9, 31 Queen Street, Melbourne, Victoria 3000. The Sepon project comprises a 1947 square kilometre contract area located approximately 40 kilometers north of the town of Sepon, in Savannakhet province of south-central Laos (Figure 1). Gold and copper deposits discovered in the Sepon district by CRA/RioTinto (1993-1999) and Oxiana (2000-2003) contain over four million ounces of gold and 1.2 million tonnes of contained copper. Seven gold and one copper deposit occur in separate adjacent deposits over five kilometers. Gold mineralisation occurs as fine disseminations in highly altered calcareous sedimentary rocks with many affinities to the Carlin style gold deposits of Nevada, USA. The Khanong copper deposit is a near surface high grade supergene chalcocite and oxide copper body derived from the weathering of a replacement style massive sulphide deposit developed in shallow dipping, highly sheared carbonate rocks. Oxiana acquired an 80% stake in the project in early 2000 with the vendor Rio Tinto retaining a 20% shareholding. Upon finalisation of the asset sale in August 2000 Oxiana immediately commenced feasibility and environmental - social impact studies for a two stage development of the Sepon gold and copper projects. Following a 12 months construction period, the 1.25 mtpa Sepon gold mine poured first gold in late December 2002 and has now been operating successfully for more than nine months. Extensive exploration and development drilling in 2003 has significantly upgraded the gold resource and reserve base to 14.2Mt @ 3.43g/t Au (70% increase in reserve ounces) and a study to expand the gold project has been initiated. Copper Project feasibility and environmental - social impact studies were completed over 10 months in 2002 including pilot plant test work at Lakefield Research in Canada. The project is designed to produce 60,000 tpa of LME grade copper cathode. In January 2003 engineering and construction of the Copper Project was awarded to a joint venture between Bateman Limited and Ausenco Limited and after 9 months of a 27 months program the project is on schedule to produce first copper in March 2005. New discoveries continue to be made and exploration for both gold and copper is ongoing with many targets remaining to be assessed. Aggressive year round drilling campaigns continue to expand both the resource and reserve bases and test the pipeline of new gold and copper targets being generated. Although numerous river valleys of the Sepon district have long been the subject of sporadic artisanal gold panning, no assessment of the hard rock potential had ever been undertaken prior to the involvement of CRA Exploration in 1990. Potential of the Sepon district was first recognised by CRA geologists during follow up of UNDP (United Nations Development Program) mineral occurrence data and information sourced from archives in the Laos Department of Geology and Mines. While the style of mineralisation was not immediately discernable, the association of porphyry intrusives, district scale alteration and extensive gold occurrences (alluvial and hardrock) was considered highly significant. When the assay results for 18 rock samples reported between 3.6 and 55.9g/tAu prospectivity was confirmed. An application covering 5000 square kilometers in Savannakhet and Khammouane Provinces was submitted to the Lao Government in early 1991. Following two years of pioneering negotiations, a Mineral Exploration and Production Agreement (MEPA) similar to the Indonesian Contract of Work was signed in September 1993. This Agreement provides for the exclusive right to explore, mine, process, transport and market all minerals from the MEPA area and clearly defines the life of project commercial and fiscal framework. Intensive exploration by CRA/RioTinto between 1993 and 1999 resulted in the discovery of around 3 Moz of gold and an estimated 0.9 Mt of contained copper in six separate deposits. In 1999 Rio Tinto decided to divest of the Sepon Project because it did not satisfy the companies resource size criteria. The project was put to competitive tender and following extensive due diligence Oxiana successfully bid for an 80% stake in the project in early 2000. Rio Tinto retained a 20% shareholding and has continued to provide strong support for Oxiana’s subsequent gold and copper mine developments. Regional exploration of the broader Sepon area commenced in late 1994 following the discovery and initial assessment of the Discovery and Namkok deposits. Programs comprising detailed regional stream sediment and rock geochemistry, geological mapping, airborne magnetic and radiometric surveys and remote sensed Landsat and photo interpretation were completed over the entire 5000 square kilometer area in late 1994 and 1995. Airborne magnetics proved useful in regional structural analysis but was of limited use in direct targeting. Although the porphyry bodies do not have discernable magnetic signatures, surrounding skarns are detectable. Radiometrics clearly mapped potassic alteration of the porphyry bodies, including dykes and sills, where exposed. Stream sediment geochemistry (-80#) clearly outlined a standout high order district scale multi-element geochemical signature over 400 square kilometers around the initial discoveries. Subsequently, this highly mineralised trend representing the Sepon Mineral District has been the dominant focus of exploration for gold and copper. While exploration at the district scale has utilised a wide spectrum of techniques and technologies, programs have always maintained a strong geological focus with an emphasis on basic prospecting, geological mapping and drilling. High quality geological, geochemical and geophysical data has been systematically collected, progressively compiled, interpreted and revised to develop a solid understanding of the geology, tectonic framework, and mineralisation at regional, district and prospect scales. Detailed exploration has incorporated geological mapping ranging in scale from 1:25000 to 1:500, soil and rock geochemistry and ground geophysics including IP, CSAMT, magnetics, radiometrics and gravity. Soil geochemistry on 400 meter spaced lines has been completed over the entire 400sqkm district along with extensive rock geochemistry. Extensive use of oriented diamond core drilling early in the project life and the utilisation of a wide spectrum of specialist consultants to compliment the field skills of the project exploration team provided a solid basis for understanding the complex interrelationships between mineralisation, stratigraphy, structure and intrusive phases. As part of the project feasibility studies, a detailed drilling program comprising approximately 900 holes and 30,000 meters was completed in 2000-2002 to evaluate the oxide and partial oxide components of the gold deposits, and the supergene copper deposit. The rapid transition from exploration to resource evaluation and feasibility required specialist input as no member of the exploration team had prior resource evaluation experience. Resource consultants Hellman and Schofield Pty Ltd who had conducted the resource due diligence for Oxiana’s acquisition of the Sepon project were contracted to develop and assist implementation of appropriate drilling, logging, sampling, assaying and quality control – quality assurance protocols and to upgrade database systems. Drilling utilising two RC rigs was completed on a nominal 50 metre drill pattern with priority areas for early mine development infilled to a 25x25 metre pattern. Diamond core drilling was used to collect sample for metallurgical test work and to twin several RC holes in each deposit. Geostatistical resource estimates were completed by Hellman and Schofield Pty Ltd using the multiple indicator kriging (“MIK”) method for gold and ordinary kriging for copper. Since the commencement of mining, detailed pit mapping and analysis of grade control drilling data has been utilised to significantly upgrade geological understanding of the deposits, in particular the controls on mineralisation. This enhanced geological framework is being coupled with existing data sets to enhance the predictive capacity of exploration targeting. Aggressive drilling campaigns utilising three RC and two diamond core rigs are continuing to expand the resource base and test a pipeline of gold and copper targets being generated. Sepon Mineral District stratigraphy comprises Devonian to Carboniferous aged continental fluvial and shallow to deep marine sediments deposited in a half graben basin. The sedimentary package has been divided into nine lithology based formations (Morris 1995) of which the lower and upper contacts of formation 6, a calcareous, carbonaceous mudstone host most of the known gold mineralisation. Sediments generally dip moderately towards the north and north-west. Dominant fault directions are north-west parallel to the Truongson fault system and east-west parallel to the basin bounding faults. The intersection of east-west and north-east trending faults are important in localising mineralisation and rhyodacite porphyry intrusive stocks and associated dyke and sill complexes of similar composition. Four broad alteration/mineralisation styles are recognised namely quartz stockwork porphyry Mo, Cu-Au skarn, Cu-Au carbonate replacement, and sediment-hosted Au. Gold mineralisation is localised in structural and stratigraphic fluid traps which have many affinities with the sediment-hosted gold deposits of the Carlin Trend, Nevada, USA. Mineralisation is finely disseminated and closely associated with decalcification and variable silica replacement of calcareous rocks along structures and at lithological contacts. Geometry of the gold ore is controlled by anticlinal structures and shallow dipping stratigraphy, structure and porphyry sills. Residual deflation surface remnants of the primary mineralisation are also recognised. Copper mineralisation covers a variety of primary and secondary styles. Along the contacts of the intrusive stocks, Cu-Au skarns are developed, while outbound of the skarn front lower temperature silica-sulphide replacement of carbonate rocks is common. Weathering and mobilization of the primary mineralisation gives rise to a number of secondary ore types. The Khanong copper deposit is a near surface high grade supergene derived chalcocite and oxide copper resource derived from weathering of a replacement style semi massive sulphide body hosted by shallow dipping, highly sheared carbonate rocks. In-situ supergene enrichment of this sulphide protore resulted in the development of a clay hosted, high grade chalcocite enrichment blanket immediately beneath which lies a very high grade copper oxide zone comprising malachite ± azurite ± cuprite ± minor native copper (Loader 1999). A schematic model showing the broad spectrum of mineralisation styles represented in the Sepon Mineral District is shown in figure 2. Following the completion of all legal and approval documentation for the Sepon project acquisition in August 2000, development of the project commenced in earnest. Early in the project development phase Oxiana decided that the most pragmatic approach was to develop the project in two stages, the smaller gold project first and the much larger copper project later. The major advantages of this approach included reduced front end project funding requirements, lesser early stage technical risk, and the early demonstration of a mining project’s viability in an untested host country .The following timetable indicates the broad activities that have taken place since August 2000. Commencement of Gold FS and Gold ESIA. Completion of Gold FS and ESIA. Commencement of Copper FS and Copper ESIA. Commitment to Gold Project development. Completion of Copper FS and Copper ESIA. First gold poured at Sepon. Commitment to Copper Project Development. Scheduled first production of Copper at Sepon. A considerable amount of drilling and resource evaluation as well as metallurgical test work was required and therefore in reality the FS was both a pre- feasibility study and a feasibility study. Oxiana understood that project financing requirements would entail an array of international stakeholders all of whose agendas would need to be fulfilled. A particularly important party was the International Finance Corporation (IFC) who played a significant role in setting the terms of reference for the ESIA. This inevitably added time and cost to the study phase, however the standard of documentation as well as the IFC’s direct involvement have had downstream benefits for the project and the company’s dealings with other stakeholders. Oxiana have continued to adopt the IFC (World Bank) standards during gold operations and for the copper ESIA. Although the FS and ESIA passed all IFC requirements Oxiana was ultimately able to fund the US$45M cost of the gold project from equity. Limited funds and a desire to advance the project as rapidly as possible dictated that only sufficient resources and reserves to demonstrate the Project’s economic viability were proved up. It was clearly understood and expected that the resources and ultimately reserves would be much greater than those developed during the FS. Oxiana awarded the engineering and construction of the Gold Project to Ausenco Limited who had successfully completed the Chatree Gold Mine in Thailand and were also perceived to have a strength in developing small–medium sized gold mines in remote environments. The development of the Sepon Project had a number of challenging aspects namely a significant wet season for 4 months of the year, no access to power and no telecommunication facilities, very poor site access by a dirt road which was often cut off during the wet season and unexploded ordnance across the project site – a remnant of the Vietnam war. Nonetheless the Project produced first gold on schedule in December 2002 and has been operating successfully for more than 9 months. A study to expand the gold project has recently been initiated following a significant upgrade of the resources and reserves (70% increase in reserve ounces). A key success factor in the ramp up of the Project was the recruitment of the senior team. All recruitment was undertaken in-house, typically targeting individuals who along with the requisite technical skills also needed to have had offshore experience preferably in Asia on a fly-in-fly-out roster; demonstrated high achievement and commitment levels; and most importantly a high level of cultural sensitivity and understanding. NSR Consultants and Earth Systems Lao. These Studies took 10 months to complete which included a pilot plant facility at Lakefield Research in Canada. The process flowsheet comprises crushing and grinding, atmospheric leach, solid-liquid separation, flotation and pressure leaching. This elegant flowsheet is anticipated to yield in excess of 90% copper recoveries and produce 60,000 tpa of LME grade copper cathode. In January 2003 engineering and construction of the copper project was awarded to a joint venture between Bateman Limited and Ausenco Limited. After 9 months of a 27 months program the project is on schedule to produce first copper in March 2005. Engineering is +30% complete, site bulk earthworks are +70% complete and concrete construction has commenced. Financing is outside the scope of this paper, however the financing arrangements and strategy have had a significant influence on the execution of both Projects. Sovereign and political risk, especially from the financial community has always been a major focus with the Lao PDR perceived as a communist country with little significant foreign investment track record and no mining infrastructure. Oxiana believed that this issue had the potential to significantly delay the Project and in the latter half of 2001 successfully moved to fund the Gold Project entirely from equity. Following successful development of the Gold Project potential investors have been much more willing to consider investing in Laos and Oxiana is close to finalising the debt financing package for the Copper Project with a consortium of European commercial banks, development banks and credit agencies. Adoption of World Bank Guidelines for social and environmental criteria at an early stage in the Project’s development has been significant in securing the debt funding package. As discussed earlier, the Sepon Project is a “flagship” foreign investment enterprise for Laos. The Sepon MEPA has been successfully used for over 10 years to achieve the successful implementation of the Project and both parties have abided by the content and intent of the Agreement without exception. The Government of Laos is very open and encouraging of foreign investment and all potential investors who have visited Laos have been impressed by the support given to the Project by the Government. Oxiana endeavors to ensure that all four levels of Government in Laos; Central, Provincial, District and Village are kept informed at all times and have the opportunity to participate in the development of this Lao Project. In any context, potentially the most important aspect of a successful project is an open, trusting and sharing relationship with the local community. Oxiana’s philosophy is that our ultimate mandate to operate lies with the local community and as such Community Relations takes on a primary role. Besides job creation and impacts on the environment, projects in developing countries also have major impact on social structure, wealth generation and distribution, gender issues, education, health, capacity building, local area and country development. Any project in an environment such as Sepon assumes a large responsibility, not just for the short term of the mine life, but also for the longer term sustainability of the area or region in which it operates. be prepared to eat and drink whatever is put in front of you! Gregory, C.J. 1991 Sepon Gold Prospect , Laos. CRA internal memorandum report. Loader, S.E. 1999 Supergene enrichment of the Khanong Copper Resource, Sepon Project, Lao P.D.R.. Proceedings PACRIM’99 pp 263-272.